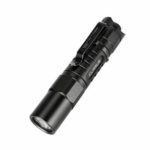 This KLARUS FX10 flashlight is an extremely powerful and high performance flashlight. 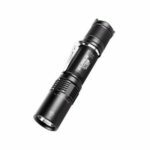 It utilizes a CREE XP-L HI V3 LED with a maximum output of 1000lm, offering 4 brightness levels and two special modes. 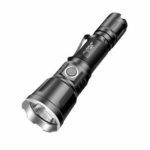 It is perfect for your outdoor adventures, search and rescue mission, camping trips and anywhere else you need a sufficient amount of light. 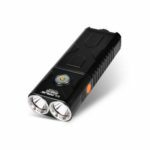 CREE XP-L HI V3 LED; extreme floodlight and spotlight beam capability; max beam distance up to 300 meters; max output up to 1000lumens. 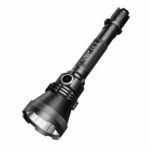 With ergonomically designed adjustable focus/zoom, modify output from spotlight to floodlight easily. Four brightness levels (turbo/high/medium/low) and two special modes (strobe/SOS) for you to choose, meet your different demands. Tactical setting: one touch strobe/one touch turbo; Outdoor setting: one touch low, one touch turbo/SOS. 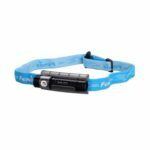 The ITS monitors and auto-adjusts output levels in real-time to keep LED and crucial component safe for the best balance of performance and equipment safety. Checking the state of battery charge at anytime, be aware of light status. Green means the battery capacity is over 70%, orange means 30-70%, red means 30%, flashing red means less than 10%. Reverse polarity protection to prevent circuit damage from incorrect battery orientation. Font and rear internally mounted springs protect against shocks and drops. IPX8 (waterproof down to 2m), suitable to use in even the most severe weather conditions. It is multifunctional and suitable for tactical, search and rescue, cycling, hiking, camping, hunting, expedition, patrol and daily use.